The Manor Hotel is in the perfect location for hikers to stay, having great access to the starting points of some of the best Brecon Beacons walks. There are countless miles of footpaths in the area and on this page we have listed some of the most popular walking routes. 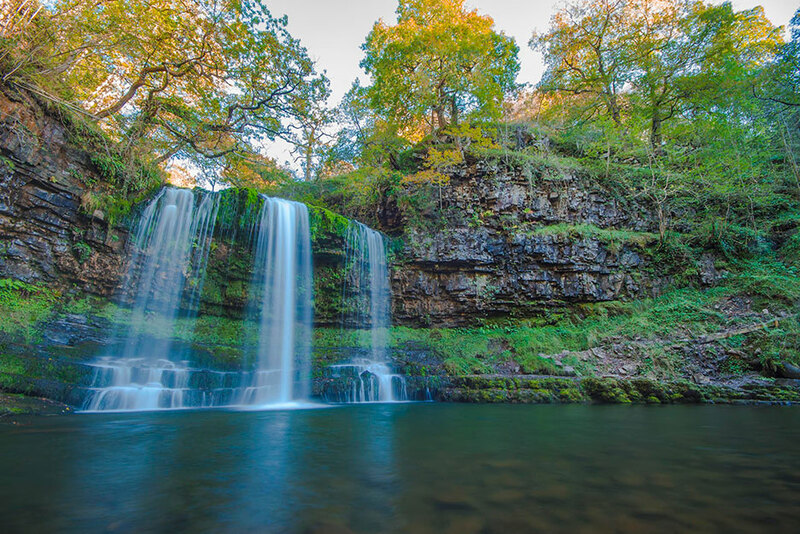 The Brecon Beacons National Park is made up of four distinct upland areas: the Brecon Beacons, the Black Mountains, the Black Mountain range and the Fforest Fawr massif. The Brecon Beacons are the highest range of the group, considered by many to be the best hills for walking in the southern UK. There are rounded contours of old red sandstone in the central Beacons, giving terrain which is open in character, with big skies to complement the big hills. By contrast, in the south of the National Park there are dazzling outcrops of carboniferous limestone, water-worn to form deep gorges, caves, and most famously of all waterfalls. The most easterly peaks in the Brecon Beacons are the Black Mountains where you’ll find tiny villages and churches set in a rolling green landscape of picturesque hills and valleys. Don’t mistake the area for the Black Mountain however; the Black Mountain (singular) is a spectacular wilderness environment in its own right, but the Black Mountains (plural) are a little less demanding for the laid-back walker. The spectacular waterfalls are a favourite with our guests. There are several trails to choose from with a range of distances and difficulty, so are suitable for those looking for a casual walk as well as those keen for a more serious hike. Talybont forest lies along the side of Glyn Collwn and the Talybont Reservoir. At the head of the forest are the waterfalls of Blaen-y-glyn. At the end of the 19th century the valley contained at least ten farms. Small fields with stone walls surrounded each farmstead, and the nearby woodland provided timber for building and wood for fuel. During the 19th century limestone was quarried and transported along the Brinore tramroad and Brecon-Merthyr railway and onward to South Wales. The old course of the railway is now part of the Taff trail which is suitable for Walkers and Cyclists. Turn off the A40 following signs for Talybont-on-Usk between Brecon and Bwlch. Once in Talybont-on-Usk follow signs for Talybont reservoir, passing through the village of Aber, continuing until Forestry Commission signs are seen. A huge dam above the village of Aber and around 2 miles from Talybont Village holds back the massive Talybont Reservoir. Going South towards Merthyr Tydfil, the Taff Trail runs in the woodland on the South East side of the Talybont Reservoir. It follows the long steady gradient climbing some 250m to the summit. This is the Seven Mile Bank of the former Brecon and Merthyr Railway. Turn off the A40 following signs for Talybont-on-Usk between Brecon and Bwlch. Once in Talybont-on-Usk follow signs for Talybont reservoir. Pen y Fan is the highest peak in the area and the most popular of all the Brecon Beacons walks. With breathtaking views from the summit it is another favourite with walkers. There are several routes you can take, so you can spend anything from 3 hours to all day exploring the peaks. Follow the A40 towards Brecon then take the first exit at the roundabout, staying on the A40. At the next roundabout, take the first exit onto the A470. After about 7 miles you will see several options for parking, close to the Storey Arms Outdoor Education Centre with Pen y Fan rising steeply above it to your left.